For the 2004 Japanese film, see Hikikomori: Tokyo Plastic. For the 2008 South Korean film, see Loner (film). In Japan, hikikomori (Japanese: ひきこもり or 引きこもり, lit. "pulling inward, being confined", i.e., "acute social withdrawal"; colloquially/adaptive translation: shutter) are reclusive adolescents or adults who withdraw from society and seek extreme degrees of isolation and confinement. Hikikomori refers to both the phenomenon in general and the recluses themselves. Hikikomori have been described as loners or "modern-day hermits". Estimates suggest that half a million Japanese youth have become social recluses, as well as more than half a million middle aged individuals. The Japanese Ministry of Health, Labour, and Welfare defines hikikomori as a condition in which the affected individuals refuse to leave their parents' house, and isolate themselves away from society and family in a single room for a period exceeding six months. The psychiatrist Tamaki Saitō defines hikikomori as "a state that has become a problem by the late twenties, that involves cooping oneself up in one's own home and not participating in society for six months or longer, but that does not seem to have another psychological problem as its principal source". no apparent physical or mental etiology to account for the social withdrawal symptoms. The psychiatrist Alan Teo first characterized hikikomori in Japan as modern-day hermits, while the literary and communication scholar Flavio Rizzo similarly described hikikomori as "post-modern hermits" whose solitude stems from ancestral desires for withdrawal. While the degree of the phenomenon varies on an individual basis, in the most extreme cases, some people remain in isolation for years or even decades. 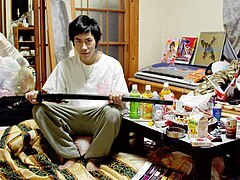 Often hikikomori start out as school refusers, or futōkō (不登校) in Japanese (an older term is tōkōkyohi (登校拒否)). While many people feel the pressures of the outside world, hikikomori react by complete social withdrawal. In some more extreme cases, they isolate themselves in their bedrooms for months or years at a time. They usually have few or no friends. In interviews with current or recovering hikikomori, media reports and documentaries have captured the strong levels of psychological distress and angst felt by these individuals. While hikikomori favour indoor activities, some venture outdoors occasionally. The withdrawal from society usually starts gradually. Affected people may appear unhappy, lose their friends, become insecure and shy, and talk less. According to government figures released in 2010, there are 700,000 individuals living as hikikomori with an average age of 31. Still, the numbers vary widely among experts. These include the hikikomori who are now in their 40s and have spent 20 years in isolation. This group is generally referred to as the "first-generation hikikomori.” There is concern about their reintegration into society in what is known as "the 2030 Problem,” when they are in their 60s and their parents begin to die. Additionally, the government estimates that 1.55 million people are on the verge of becoming hikikomori. Tamaki Saitō, who first coined the phrase, originally estimated that there may be over one million hikikomori in Japan, although this was not based on national survey data. Nonetheless, considering that hikikomori adolescents are hidden away and their parents are often reluctant to talk about the problem, it is extremely difficult to gauge the number accurately. A 2015 Cabinet Office survey estimated that 541,000 recluses aged 15 to 39 existed. In 2019, another survey showed that there are roughly 613,000 people aged 40 to 64 that fall into the category of "adult hikikomori", which Japan's welfare minister Takumi Nemoto referred to as a "new social issue." While hikikomori is mostly a Japanese phenomenon, cases have been found in the United States, Morocco, Oman, Spain, Italy, South Korea, Finland and France. Recent research using the same standardized definition of hikikomori has found evidence of it existing in other countries as wide-ranging as the United States and India. Hikikomori is similar to the social withdrawal exhibited by some people with autism spectrum disorders, a group of disorders that include Asperger syndrome, PDD-NOS and "classic" autism. This has led some psychiatrists to suggest that hikikomori may be affected by autism spectrum disorders and other disorders that affect social integration, but that their disorders are altered from their typical Western presentation because of the social and cultural pressures unique to Japan. Suwa & Hara (2007) discovered that 5 of 27 cases of hikikomori had a high-functioning pervasive developmental disorder (HPDD), and 12 more had other disorders or mental diseases (6 cases of personality disorders, 3 cases of obsessive-compulsive disorder, 2 cases of depression, 1 case of slight mental retardation). The researchers used a vignette to illustrate the difference between primary hikikomori (without any obvious mental disorder) and hikikomori with HPDD or other disorder; furthermore, 10 out of 27 had primary hikikomori. Alan Teo and colleagues conducted detailed diagnostic evaluations of 22 individuals with hikikomori and found that while the majority of cases fulfilled criteria for multiple psychiatric conditions, about 1 in 5 cases were primary hikikomori. According to Michael Zielenziger's book, Shutting Out the Sun: How Japan Created Its Own Lost Generation, the syndrome is more closely related to posttraumatic stress disorder. The author claimed that the hikikomori interviewed for the book had discovered independent thinking and a sense of self that the current Japanese environment could not accommodate. The syndrome also closely parallels the terms avoidant personality disorder, schizoid personality disorder, schizotypal personality disorder or social anxiety disorder (also known as "social phobia"). Sometimes referred to as a social problem in Japanese discourse, hikikomori has a number of possible contributing factors. Alan Teo has summarized a number of potential cultural features that may contribute to its predominance in Japan. These include tendencies toward conformity and collectivism, overprotective parenting, and particularities of the educational and economic systems. Acute social withdrawal in Japan appears to affect both genders equally. However, because of differing social expectations for maturing boys and girls, the most widely reported cases of hikikomori are from middle- and upper-middle-class families; sons, typically their eldest, refuse to leave the home, often after experiencing one or more traumatic episodes of social or academic failure. In The Anatomy of Dependence, Takeo Doi identifies the symptoms of hikikomori, and explains its prevalence as originating in the Japanese psychological construct of amae (in Freudian terms, "passive object love", typically of the kind between mother and infant). Other Japanese commentators such as academic Shinji Miyadai and novelist Ryū Murakami, have also offered analysis of the hikikomori phenomenon, and find distinct causal relationships with the modern Japanese social conditions of anomie, amae and atrophying paternal influence in nuclear family child pedagogy. Young adults may feel overwhelmed by modern Japanese society, or be unable to fulfill their expected social roles as they have not yet formulated a sense of personal honne and tatemae – one's "true self" and one's "public façade" – necessary to cope with the paradoxes of adulthood. The dominant nexus of hikikomori centres on the transformation from youth to the responsibilities and expectations of adult life. Indications are that advanced industrialized societies such as modern Japan fail to provide sufficient meaningful transformation rituals for promoting certain susceptible types of youth into mature roles. As do many societies, Japan exerts a great deal of pressure on adolescents to be successful and perpetuate the existing social status quo. A traditionally strong emphasis on complex social conduct, rigid hierarchies and the resulting, potentially intimidating multitude of social expectations, responsibilities and duties in Japanese society contribute to this pressure on young adults. Historically, Confucian teachings de-emphasizing the individual and favouring a conformist stance to ensure social harmony in a rigidly hierarchized society have shaped much of East Asia, possibly explaining the emergence of the hikikomori phenomenon in other East Asian countries. The inability of Japanese parents to recognize and act upon the youth's slide into isolation; soft parenting; or codependence between mother and son, known as amae in Japanese. A decade of flat economic indicators and a shaky job market in Japan makes the pre-existing system requiring years of competitive schooling for elite jobs appear like a pointless effort to many. Although the connection between modern communication technologies such as the Internet, social media and video games, and the phenomenon is not conclusvely established, it is considered at least an exacerbating factor that can deepen and nurture withdrawal. Previous studies of hikikomori in South Korea and Spain found that some of them showed signs of Internet addiction, although researchers do not consider this to be the main issue. However, according to associate professor of psychiatry at Kyushu University in Fukuoka Takahiro Kato, video games and social media have reduced the amount of time that people spent outside and in social environments that require direct face to face interaction. The emergence of mobile phones may have exacerbated the issue, given that people can continue their addictition on gaming and online surfing anywhere even in bed. The Japanese education system, like those found in China, Singapore and South Korea, puts great demands upon youth. A multitude of expectations, high emphasis on competition, and the rote memorization of facts and figures for the purpose of passing entrance exams into the next tier of education in what could be termed a rigid pass-or-fail ideology, induce a high level of stress. Echoing the traditional Confucian values of society, the educational system is viewed as playing an important part in society's overall productivity and success. In this social frame, students often face significant pressure from parents and the society in general to conform to its dictates and doctrines. These doctrines, while part of modern Japanese society, are increasingly being rejected by Japanese youth in varying ways such as hikikomori, freeter, NEET (Not currently engaged in Employment, Education, or Training), and parasite singles. The term "Hodo-Hodo zoku" (the "So-So tribe") applies to younger workers who refuse promotion to minimize stress and maximize free time. Beginning in the 1960s, the pressure on Japanese youth to succeed began successively earlier in their lives, sometimes starting before pre-school, where even toddlers had to compete through an entrance exam for the privilege of attending one of the best pre-schools. This was said to prepare children for the entrance exam of the best kindergarten, which in turn prepared the child for the entrance exam of the best elementary school, junior high school, high school, and eventually for their university entrance exam. Many adolescents take one year off after high school to study exclusively for the university entrance exam, and are known as ronin. More prestigious universities have more difficult exams. The most prestigious university with the most difficult exam is the University of Tokyo. Since 1996, the Japanese Ministry of Education has taken steps to address this 'pressure-cooker' educational environment and instill greater creative thought in Japanese youth by significantly relaxing the school schedule from six-day weeks to five-day weeks and dropping two subjects from the daily schedule, with new academic curricula more comparable to Western educational models. However, Japanese parents are sending their children to private cram schools, known as juku, to 'make up' for lost time. Another source of pressure is from their co-students, who may harass and bully (ijime) some students for a variety of reasons, including physical appearance, wealth, or educational or athletic performance. Some have been punished for bullying or truancy, bringing shame to their families. Refusal to participate in society makes hikikomori an extreme subset of a much larger group of younger Japanese that includes parasite singles and freeters. Some organizations such as the non-profit Japanese organization NPO lila have been trying to combat the financial burden the hikikomori phenomenon has had on Japan's economy. The Japanese CD and DVD producer Avex Group produces DVD videos of live-action women staring into a camera to help hikikomori learn to cope with eye contact and long spans of human interaction. The goal is to help hikikomori reintegrate into society by personal choice, thereby realizing an economic contribution and reducing the financial burden on parents. ^ Kremer, William; Hammond, Claudia (5 July 2003). "Hikikomori: Why are so many Japanese men refusing to leave their rooms?". BBC News. BBC. Retrieved 11 March 2016. ^ a b c Teo, Alan (8 November 2012). Modern-Day Hermits: The Story Hikkomori in Japan and Beyond (YouTube). University of Michigan Center for Japanese Studies. Retrieved 26 February 2014. ^ Jozuka, Emiko (12 September 2016). "Why won't 541,000 young Japanese leave the house?". CNN News. Retrieved 27 March 2018. ^ a b "613,000 in Japan aged 40 to 64 are recluses, says first government survey of hikikomori". The Japan Times Online. 29 March 2019. ISSN 0447-5763. Retrieved 29 March 2019. ^ Teo & Gaw 2010; Teo et al. 2015, p. 182. ^ Rizzo, Flavio (14 June 2016). "Hikikomori: The Postmodern Hermits of Japan". Warscapes. Retrieved 17 June 2016. ^ a b Teo 2013. ^ "Hikikomori: Japan's Lost Generation of Digital Age Hermits". ^ a b c Hoffman, Michael (9 October 2011). "Nonprofits in Japan help 'shut-ins' get out into the open". The Japan Times Online. Retrieved 24 July 2014. ^ Gozlan, Marc (9 June 2012). "Des cas d'hikikomori en France". Le Monde (in French). p. 3. Retrieved 7 June 2017. ^ Kary, Tiffany (2003). "Total Eclipse of the Son: Why are Millions of Japanese Youths Hiding from Friends and Family?". Psychology Today. ^ Suwa & Hara 2007. ^ Teo et al. 2015, p. 182. ^ Teo, Stufflebam & Kato 2014. ^ Okano & Tsuchiya 1999. ^ a b c Gent, Edd. "The plight of Japan's modern hermits". www.bbc.com. Retrieved 29 March 2019. ^ ""Hikikomori": Social Recluses in the Shadows of an Aging Japan". nippon.com. 19 July 2017. Retrieved 29 March 2019. ^ a b Jones, Maggie (15 January 2006). "Shutting Themselves In". The New York Times Magazine. Retrieved 11 March 2016. ^ a b "BBC NEWS - Programmes - Correspondent - Japan: The Missing Million". 20 October 2002. Retrieved 11 March 2016. ^ "NPO法人 楽の会リーラ". Npo-lila.com. Archived from the original on 22 June 2013. Retrieved 18 June 2013. ^ "Hikikomori - Japan's Social Ghosts - Kuma Language Services". 18 July 2016. Retrieved 11 August 2016. Doi, Takeo (1973). The Anatomy of Dependence. Translated by Bester, John. Tokyo: Kodansha. Itou, Junichirou (2003). Shakaiteki Hikikomori Wo Meguru Tiiki Seisin Hoken Katudou No Guide-line [Guideline on Mental Health Activities in Communities for Social Withdrawal] (in Japanese). Tokyo: Ministry of Health, Labor, and Welfare. Japan. Ministry of Health, Labour and Welfare (2006). White Paper on Labour and Economy 2006: Diversification of Employment and Working Life. Translated by the Japan Institute for Labour Policy and Training. Ministry of Health, Labour, and Welfare. Mathews, Gordon; White, Bruce (2004). Japan's Changing Generations: Are Young People Creating a New Society?. London: Routledge Courzon. ISBN 978-0-415-32227-0. Okano, Kaori; Tsuchiya, Motonori (1999). Education in Contemporary Japan: Inequality and Diversity. Contemporary Japanese Society. Cambridge, England: Cambridge University Press. ISBN 978-0-521-62686-6. Rohlen, Thomas P. (1989). "Order in Japanese Society: Attachment, Authority, and Routine". Journal of Japanese Studies. 15 (1): 5–40. doi:10.2307/132406. ISSN 0095-6848. JSTOR 132406. ——— (1992). "Learning: The Mobilization of Knowledge in the Japanese Political Economy". In Kumon, Sumpei; Rosovsky, Henry (eds.). The Political Economy of Japan. Volume 3: Cultural and Social Dynamics. Stanford, California: Stanford University Press. pp. 321–363. ISBN 978-0-8047-1992-6. ——— (1996). "Building Character". In Rohlen, Thomas P.; Le Tendre, Gerald K. (eds.). Teaching and Learning in Japan. Cambridge, England: Cambridge University Press. pp. 50–74. ISBN 978-0-521-49587-5. Saitō, Tamaki (1998). Hikikomori kyūshutsu manyuaru [How to Rescue Your Child from "Hikikomori"] (in Japanese). Tokyo: PHP Kenkyūjo. ——— (2012). Social Withdrawal: Adolescence without End. Translated by Angles, Jeffrey. Minneapolis, Minnesota: University of Minnesota Press. Suwa, Mami; Hara, Koichi (2007). "'Hikikomori' among Young Adults in Japan: The Importance of Differential Diagnosis between Primary Hikikomori and Hikikomori with High-functioning Pervasive Developmental Disorders" (PDF). 医療福祉研究 [Medical and Welfare Research]. 3: 94–101. ISSN 1349-7863. Retrieved 7 September 2017. Teo, Alan R. (2013). "Social Isolation Associated with Depression: A Case Report of Hikikomori". International Journal of Social Psychiatry. 59 (4): 339–341. doi:10.1177/0020764012437128. PMC 4886854. PMID 22408115. Teo, Alan R.; Gaw, Albert (2010). "Hikikomori, a Japanese Culture-Bound Syndrome of Social Withdrawal? A Proposal for DSM-5". Journal of Nervous and Mental Disease. 198 (6): 444–449. doi:10.1097/NMD.0b013e3181e086b1. PMC 4912003. PMID 20531124. Teo, Alan R.; Stufflebam, Kyle W.; Kato, Takahiro A. (2014). "The Intersection of Culture and Solitude: The Hikikomori Phenomenon in Japan". In Coplan, Robert J.; Bowker, Julie C. (eds.). The Handbook of Solitude: Psychological Perspectives on Social Isolation, Social Withdrawal, and Being Alone. Wiley-Blackwell. pp. 445–460. ISBN 978-1-118-42736-1. Teo, Alan R.; Stufflebam, Kyle; Saha, Somnath; Fetters, Michael D.; Tateno, Masaru; Kanba, Shigenobu; Kato, Takahiro A. (2015). "Psychopathology Associated with Social Withdrawal: Idiopathic and Comorbid Presentations". Psychiatry Research. 228 (1): 182–183. doi:10.1016/j.psychres.2015.04.033. ISSN 0165-1781. PMID 25977071. Retrieved 7 September 2017. Tsukada, Mamoru (1991). Yobiko Life: A Study of the Legitimation Process of Social Stratification in Japan. Berkeley, California: University of California. ISBN 978-1-55729-031-1. White, Merry (1987). The Japanese Educational Challenge. New York: The Free Press. ISBN 978-4-7700-1373-6. Zielenziger, Michael (2006). Shutting Out the Sun: How Japan Created Its Own Lost Generation. New York: Vintage Books (published 2007). ISBN 978-1-4000-7779-3. Goodman, Roger; Imoto, Yuki; Toivonen, Tuukka, eds. (2012). A Sociology of Japanese Youth: From Returnees to NEETs. Nissan Institute/Routledge Japanese Studies Series. 83. Abingdon, England: Routledge. ISBN 978-0-415-66926-9. Kuhn, Kevin (2012). Hikikomori (in German). Berlin: Berlin Verlag. ISBN 978-3-8270-1116-9. Toivonen, Tuukka; Norasakkunkit, Vinai; Uchida, Yukiko (2011). "Unable to Conform, Unwilling to Rebel? Youth, Culture, and Motivation in Globalizing Japan". Frontiers in Psychology. 2 (207): 207. doi:10.3389/fpsyg.2011.00207. ISSN 1664-1078. PMC 3171786. PMID 21949510. "BBC World Service - People Fixing The World, 'Rental sisters' for Japan's Reclusive Young Men". BBC. Retrieved 19 October 2018. Butet-roch, Laurence. "Pictures Reveal the Isolated Lives of Japan's Social Recluses". National Geographic. Archived from the original on 13 December 2018. Retrieved 13 April 2019.